Swollen with naivety and fortitude, in 2003 I moved in New York City. I knew few people so though nothing of the 90 minute subway ride from Bed Stuy to the Bronx to see a familiar face. The reward for this proved to be much more then conversation, it was my introduction to an iconic NYC dish: General Tso’s Tofu. A quintessentially Chinese-American sauce—cloyingly sweet and salty with soy—shellacked on cubes of deep fried soft tofu, scattered with ornamental dried chilies, and strewn with lightly steamed broccoli. To be cliche, it was love at first bite. 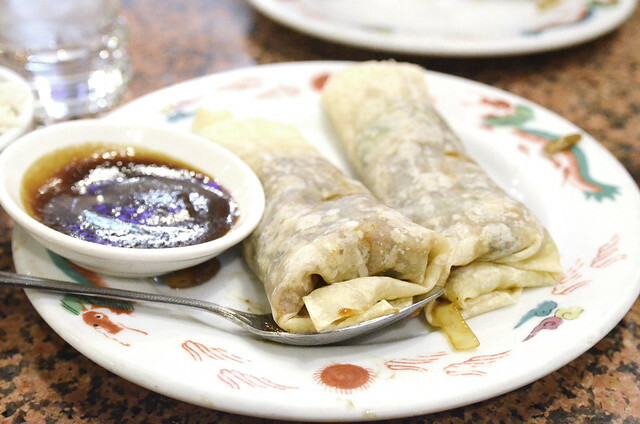 During my NYC tenure I ate this dish frequently—about 52 times a year—but moving to California killed the affair. Not because my heart no longer yearns for glazed crispy tofu, but because it seems no one else in San Diego’s does. General Tso’s Tofu is near impossible to find*—although I have a good source in Los Angeles, made with soy chicken, if you are so inclined. Before we hit fryers, lets take a moment to honor the perfect execution of this classic 1960’s Chinese-American dish: Vegetable Moo Shu ($12.25). 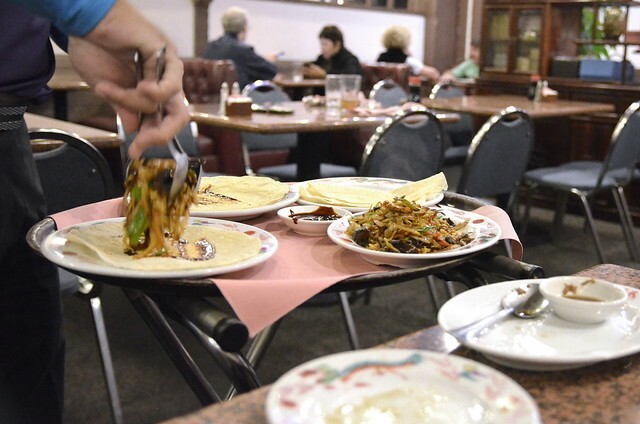 Prepared table-side, the thin flour pancakes are spread with sweet and pungent hoisin sauce then stacked with sautéed vegetables and rolled burrito style by the waiter using only a set of spoons. 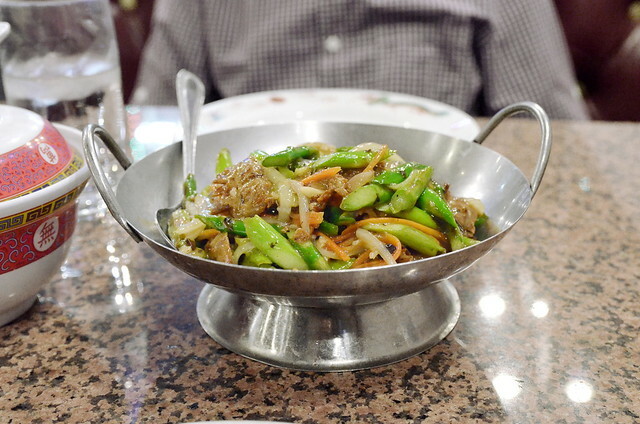 On my last visit the waiter shooed me away from this dish, swearing that commercial hoisin sauce is not vegan. This lead me down an internet rabbit hole of research from which I emerged knowing that in Chinese hoisin literally translates to”seafood” or “sea freshness” but today’s rendition of the sauce contains no seafood nor is it used on seafood. I also scoured the ingredients of various restaurant grade hoisins and could find none that were not nominally** vegan. No matter how much we insisted we were cool with hoisn the waiter was having none it. 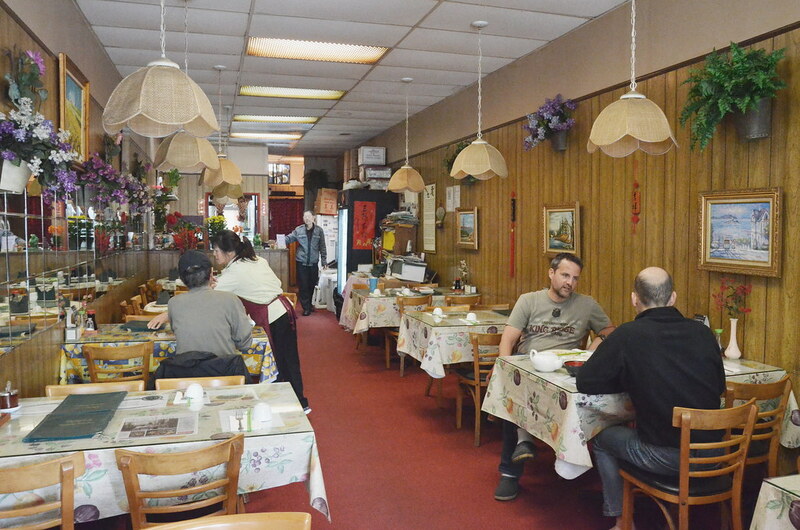 Moving on to purer pastures we tried the Vegetarian Dumpling ($6.55). Slicing one open I halted consumption, sure we accidentally got chicken. Waving the waiter over I showed him the interior looking to confirm my suspicion. 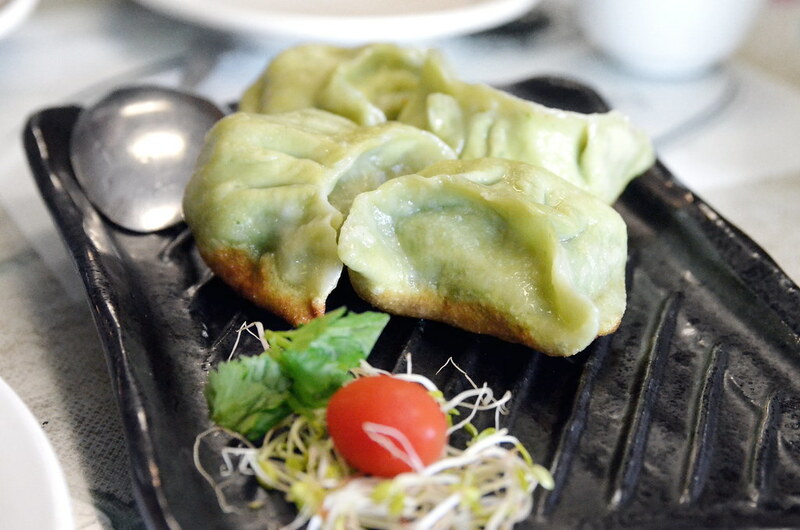 Instead he explained that their “vegetarian dumplings” are not “vegetable” but are instead filled with minced soy meat mimicking a chicken dumpling. Relieved we devoured them with the fresh ginger laced soy sauce. They were okay, rather bland. 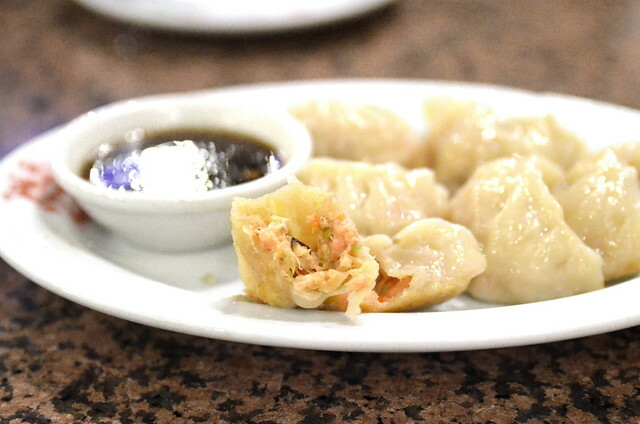 I would have preferred a minced vegetable filling… which leads me to believe that maybe vegetable dumplings are simply better then chicken ones, vegan or not. 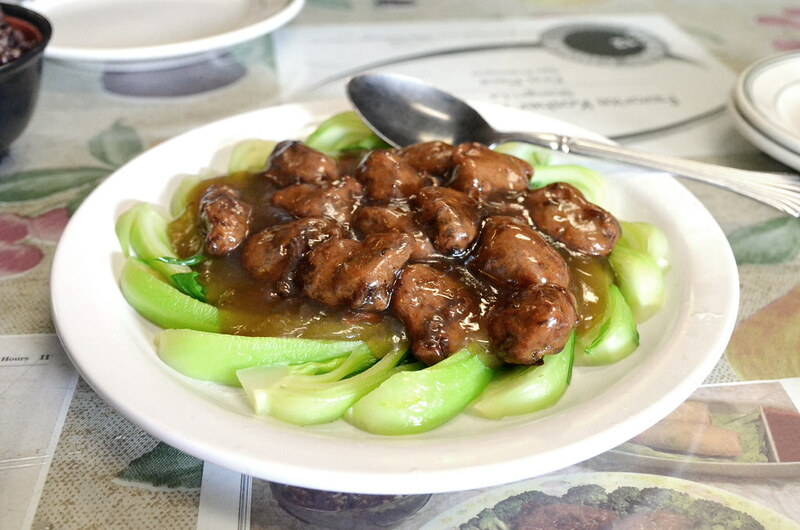 Although there is no General Tso on the menu, the Sweet and Pungent Chicken ($12.55) keeps me coming back. Battered soy chicken fried crisp and enameled in a sweet pineapple, soy, and chili sauce with chunks of pineapple and broccoli. While I’m not sure what makes this dish pungent, it otherwise hit all my happiness receptors. 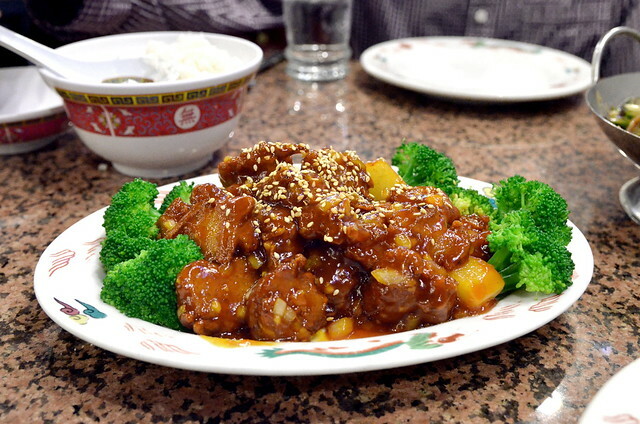 The sticky sweet Orange Flavored Sauce Veggie Chicken ($12.25) is a close second. The same battered and fried soy nuggets are tossed in a glassy orange sauce with chopped celery and plated with charming orange slices and maraschino cherries. On one particularly indecisive day, we mulled over the menu unsure of what to get. 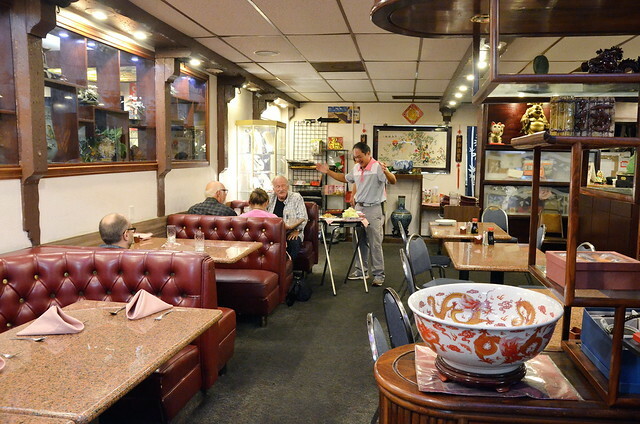 The waiter saw our fret and recommended the Sauteed Fresh Asparagus with Beef ($12.75). We were hesitant but he insisted, promising this was one if their best vegan dishes. Proudly he presented the wok kissed asparagus tossed with slivers of carrot, onions, and tears of vegan beef glistening in black bean sauce which up until then I thought I hated. But I don’t hate it. At all. In fact, I now love black bean sauce. 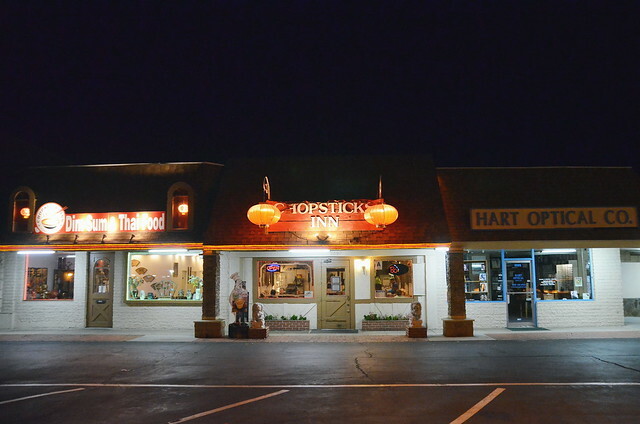 Until Chopsticks Inn I assumed the black beans in question were the same kind served with rice at Cuban restaurants or Chipotle–I know, naivety persists. This black bean sauce is composed of pungent salt fermented black soy beans, soy sauce, garlic, and some other wonderful things. This is the waiter. I should know his name, but I don’t. 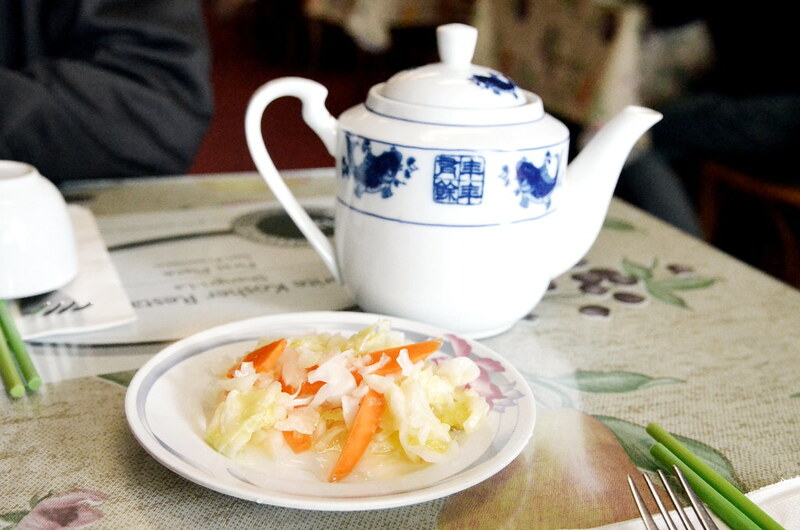 I do know his father is vegan (including the omission of onions and garlic) and that no mater how much he huffs about Chopsticks Inn not being a vegan restaurant, he is one of the most accommodating waiters I’ve have the pleasure of dining with. 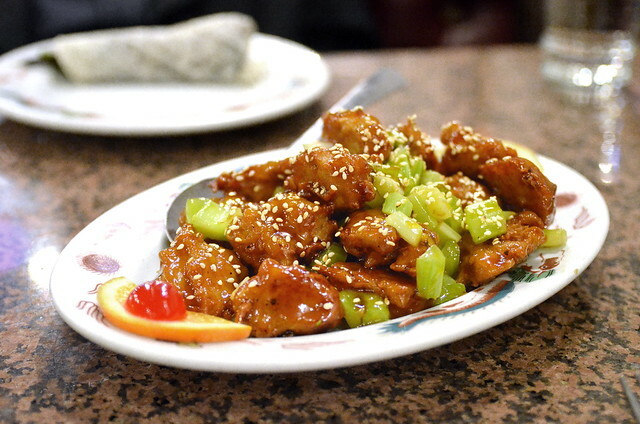 *Yes, Spiz has General Tso Tofu… but it’s not, ummm, good. **I say nominally because some have the “may contain” disclaimer. Some also include “red dye 40” which some still think is made of bugs. It is not.